BIANCONI (USA) (Bay 1995-Stud 2000). 3 wins to 6f, Ascot Diadem S., Gr.2. Sire of 951 rnrs, 586 wnrs, 19 SW, inc. Nicconi (AJC Galaxy H., Gr.1), Above Deck, Mr Martini, Schilling, Redaspen, Fillydelphia, Bianmick, Rhythm in Paris, Streetfighter, Leigh Valley, Classiconi, Taken at the Flood, Warrior of Fire, Princess Katie, Andallthatjazz, Awesome Lady, Bianconi Baby, Valparaiso, Refuse to Bend, SP Alcohol, Cavallo Nero, Biancon Rose, Gail, etc. Sir Lopez (g. by Bianconi). 5 wins. See below. Dolphin Express. 4 wins. See above. Eiffelman. Winner at 1600m in Aust. Shaara. Winner at 1300m in Aust. Accent. 3 wins. See above. Highlander. Winner at 1600m in Aust. The Rand. 8 wins to 1500m, A$178,298, AJC Ballantines Scotch H., Hanwood Port H., St Simon Welter H., STC The Southern Cross H., AJC Share the Spirit H., STC LV Lachal H., 2d STC Sapphire Welter H., AJC Balmoral H., RW Furber H., 3d AJC Matador Tow Bars Welter H., STC Eternity Welter H., Nordic Prince H.
Highlights. 3 wins. See above. SPINNING JENNY (Hard Spun). 5 wins-1 at 2-from 1100m to 2100m, A$108,625, TRC Strutt S., L, TTC F&W Stewart Silver Ingot, Toll Transport H., Ballymore Stables H., 2d TTC Best Western Hobart H.
Philda (Secret Savings). 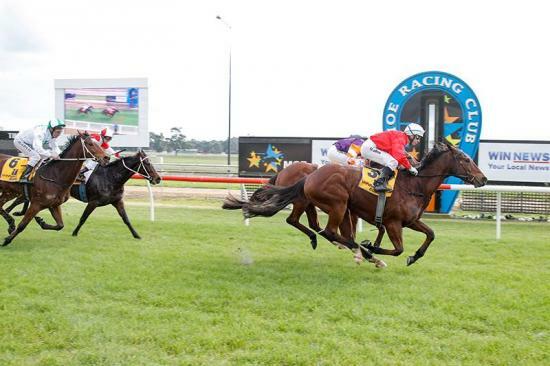 12 wins from 1200m to 1600m, A$433,808, MRC Chandler Macleod H., MVRC Geoff Torney Cup, Curran Chemicals H., 1500m-in track record time, Sportingbet H., Legends After the Last H., VRC The Big 6 H., MRC Euclase H., 2d MRC Clamms Seafood H., MVRC Dominant Don Abell Cup, Belinda Jane Verco McLeod Mile H., SAJ Catercare Group H., VRC The Big 6 H., 3d Warrnambool RC Wangoom H., L, MRC Fight Cancer Foundation H.
THE QUARTERBACK (Street Boss). 9 wins to 1400m, A$1,518,250, to 2016-17, VRC Newmarket H., Gr.1, Gilgai S., Gr.2, Dilmah Earl Grey S., L, Kensington S., L, MRC Bert Bryant H., VRC Flemington 1840-2015 H., Sale TC Inglis Trophy, 2d MRC Italktravel S., L, 3d VRC CS Hayes S., Gr.3, MRC Manfred S., Gr.3, VRC Kensington S., L, Smithfield H., MRC Owner.Racing.com Gold Sprint, VRC Red Tempo H., 4th MVRC Manikato S., Gr.1. PHILIPPI - VANILLA (H.K.) (Host). 12 wins from 1500m to 2050m, A$727,450, HK$5,113,250, to 2016-17, ATC Tulloch S., Gr.2, MVRC Alister Clark S., Gr.2, VRC UCI S., L, MVRC Sportingbet H., HKJC Dai Hei H., Savile Row H., Peony H., Ping Shan H., Morse Park H., On Ting H., Arts in the Community H., 2d Australian Derby, Gr.1, HKJC Mercury H., 3d HKJC Jockey Club Road H., 4th VRC CS Hayes S., Gr.3. The Rude Warrior (Kempinsky). 5 wins from 1600m to 1900m, S$334,985, Singapore TC Benchmark 83 H., Perak Turf Club Trophy, Initiation P., Kranji C S., Benchmark 74 H., 2d Singapore TC Kranji C S., Initiation P., Fairmont Singapore Cup Initiation P., Class 3 H.-twice, Class 4 H., 3d Singapore TC New Year Cup, L, Japan Racing Association Trophy, Open H., Class 3 H.
GRANDE ROSSO (Written Tycoon). 7 wins from 1400m to 1600m, A$396,960, to 2016-17, VRC Chester Manifold S., L, MRC John Dillon H., L, Pakenham RC Vobis Gold Bullion, MRC Mal Seccull H., 2d MRC Christmas S., L, SAJC Qatar Airways H., MRC (Mornington) Bowman & Company P., 4th MRC Blue Diamond Preview (c&g), L.
Race Record: 19 Starts 5-0-2 A$127,088. 5 wins at 2200m, 2400m, A$127,088, to 2015-16, MRC Mypunter.com H., Thebigscreencompany H., Sale TC Sale Cup Raceday H., 3d MRC Thebigscreencompany H.